It would appear that since this blog's conception I have been remiss in sharing a favourites post. The months just fly by, and my new month resolutions do as well, and I seem to see no light at the end of the procrastination tunnel. Righto then, enough self deprecation, on with some things that I have been loving, monthly favourites, current favourites, duck's nuts...or as I like to call mine, The Top Shelf. Kate Somerville Goat Milk Creme - one of the many times that Caroline Hirons spoke, and I listened. Goat Milk Creme is my go-to night cream. It is hydrating and nourishing without being heavy or greasy. On application you will noticed quite a glow...it does take a good five minutes to absorb properly. With the added benefit of a dash of lactic acid, this white pillowy goodness gets the job done. This is my second jar...thanks Kate...love your work. 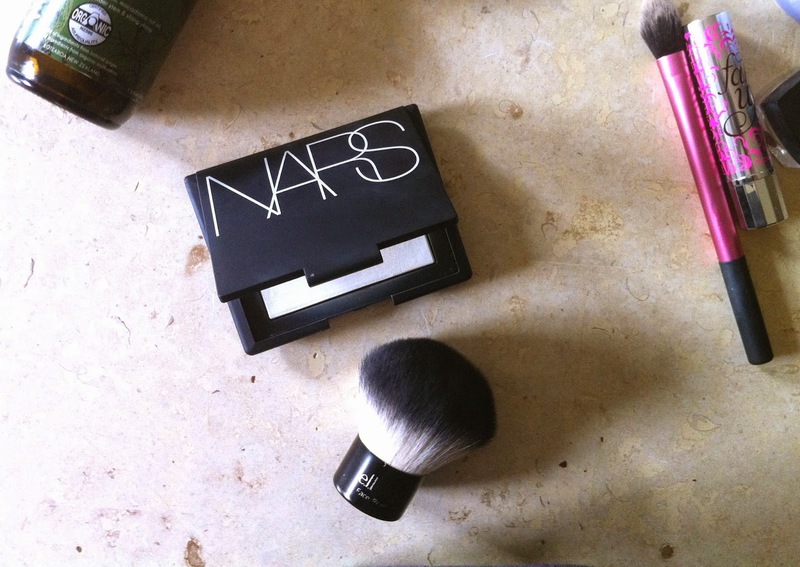 NARS Light Reflecting Pressed Powder and his handy companion the elf Kabuki brush have been my daily duo for setting my makeup. The kabuki's bristles are not too densely packed, and very soft. 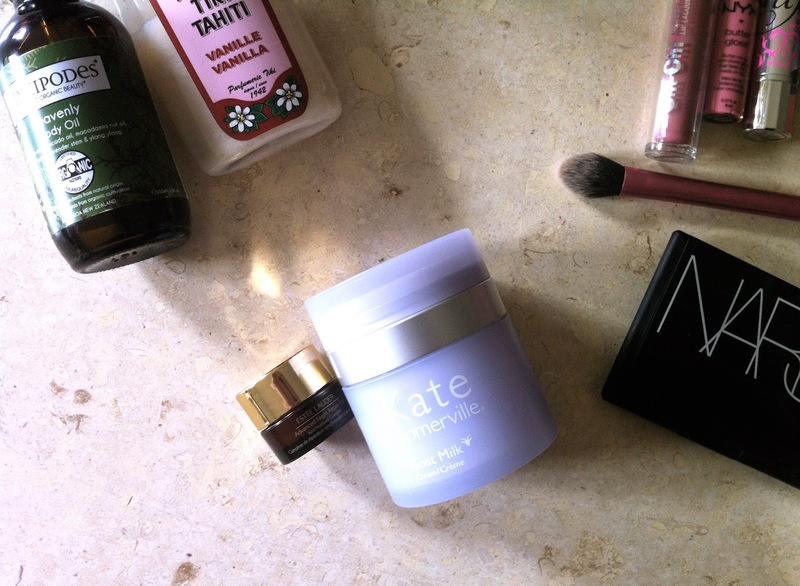 It picks up and deposits this gorgeous powder perfectly. I tap it in the pan and press it gently over my face. It sets my foundation beautifully, and I love the subtle blurring, and illuminating effect it gives my tired old face. Big thanks to Jodi from Goo Roo Beauty who warmly recommended this lovely powder. I would certainly repurchase. A recent newcomer to the Australian hair care market is the brand Fuente, Glamourous By Nature. Well known and loved internationally, the brand uses natural and organic ingredients in both its Salon colouring, and hair care products, fusing luxury with sustainability. I was recently gifted these three products for consideration, at a time when my hair was driving me nuts. It was frizzy, unmanageable and I had a very dry, irritated scalp. The Moisture Wellness Shampoo, and the Moisture Wellness Care ( conditioner ) are very nourishing, and have made a huge difference to the condition of both my hair and scalp. Designed to restore 'bounce and shine', I noticed a big improvement after 2-3 uses. If your hair and scalp need a hydrating kick, these two will do the job nicely. My hair feels so nice after I use the shampoo, I almost think I could get away without using the conditioner. They both have a pleasant, clean subtle scent, not at all overpowering. Soft Ice is certainly not your 90's style sticky hair mousse. Far from it. This is your leave-in conditioner and volumiser in one. A multi-tasking mousse!! I work it through my hair evenly prior to blow drying, and crikey it gives you some volume! If I choose to let my hair dry naturally, I am never left with crunchy sticky hair, it just feels soft and conditioned. The only beef I have with this product is the dispenser. a light squeeze will deliver a rather large amount, and too much product just weighs my hair down, so to avoid wastage, I recommend a light hand on the nozzle! Oh, and by the way, it smells really good...like really really good. A little bit sweet, a little bit coconutty...need I say more? 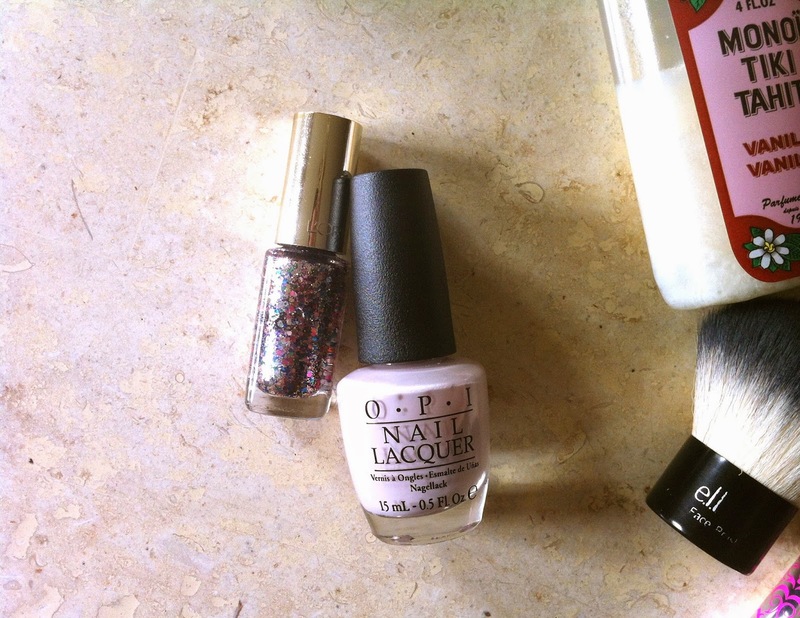 I though I would include a favourite nail combo from a manicure I posted on instagram recently. I used OPI Don't Bossa Nova Me Around for my base and L'Oreal Sequin Explosion for my glitter gradient. I wasn't sure about it at first, but it grew on me, and I got so many compliments! Here it is below. Oh the curse of dry, itchy winter skin! These two body oils have absolutely been my skin saviours this winter. The Monoi Tiki Tahiti Vanilla Coconut oil...ugh... words cannot describe how good this smells!! As you can see it is solidified in the bottle at present due to our cold temperatures, but doesn't take much to soften up enough to squeeze out a blob. I typically use this in the shower, after cleansing, just before I hop out. Any body product with a high oil content will serve this purpose nicely, even plain coconut oil. You don't need a specific in-shower moisturiser. I can safely say that I will always have a bottle of this vanilla/coconut loveliness in my stash. Highly recommend. Antipodes Heavenly Body Oil is absolutely heavenly in every sense of the word. A base of avocado and macadamia oil with Jasmine, Lavender and Ylang Ylang, this oil's fragrance is stunning. If you love lavender, and I mean really love lavender, then you will adore this body oil as much as I do. As nourishing and nutrient rich as the oils are, it is suprisingly lightweight and absorbs quickly and easily. I was gifted this body oil by Antipodes a few months ago, and when it runs out I will be purchasing another. If you suffer from stress, have trouble sleeping or difficulty quietening a busy mind, this indulgent oil will do wonders. Gorgeously glowing, fragrant skin on your list? It's on mine. I discovered Benefit's fakeup under eye concealer in January of this year, and have used it almost daily since then. You can read my full review of it here to find out more. 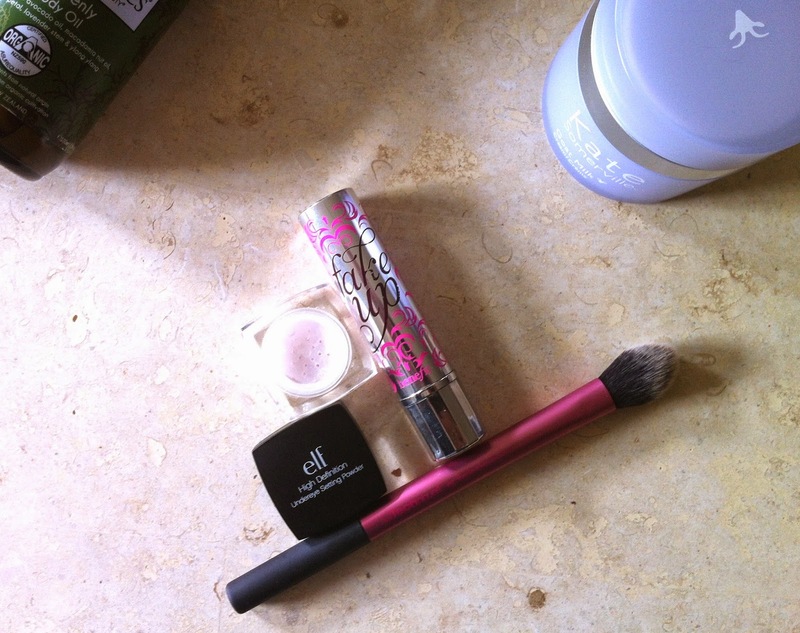 The elf High Definition Undereye Setting Powder is a fairly recent purchase, but I had to include it in this post, because I love it so much! It manages to set my concealer without looking powdery or dry, whilst cleverly brightening the undereye area beautifully. The Real Techniques setting brush applies it perfectly. I have found these two products to work really well together, and I would not hesitate to warmly recommend both. NYX Butter Gloss in Vanilla Cream Pie, and CHI CHI Dramatic Lip Laquer in the shade Bombshell have been my choice for a quick, easy wash of neutral pink. They look a little intense in this picture, but are definitely more muted and subtle in real life. Both offer a nice bit of colour and shine, and feel comfortable on the lips. Do leave a comment below if you have tried any of these products! What are the current beauty bits that have made it to your Top Shelf? I would love to hear from you as always! 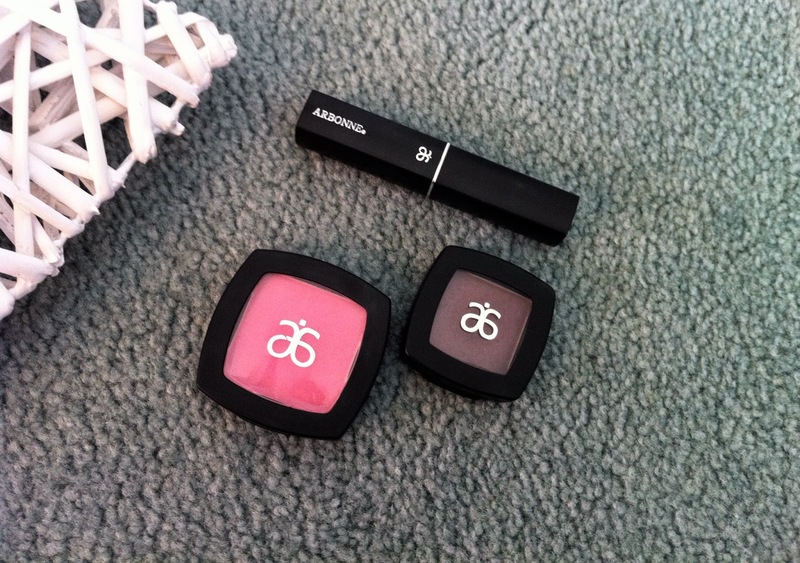 Arbonne is a brand that is quite new to me. I have tried a couple of skincare samples in the past, but have not ventured into any of their colour cosmetics range. Although it is now available to purchase online, the majority of Arbonne's business is based on independent consultants and at-home parties. Sometimes such 'parties' seem to do the rounds so to speak...and it largely depends on your circle of friends as to whether you are introduced to a brand or not. Arbonne offer state of the art skincare, haircare, cosmetics and dietary supplements based on natural, botanical ingredients. Arbonne was first established in Sweden in 1975, the year I was born! ( who doesn't love a bit of trivia? ) and are now based in the US. The three products I have to share with you today were sent to me for the purpose of review. 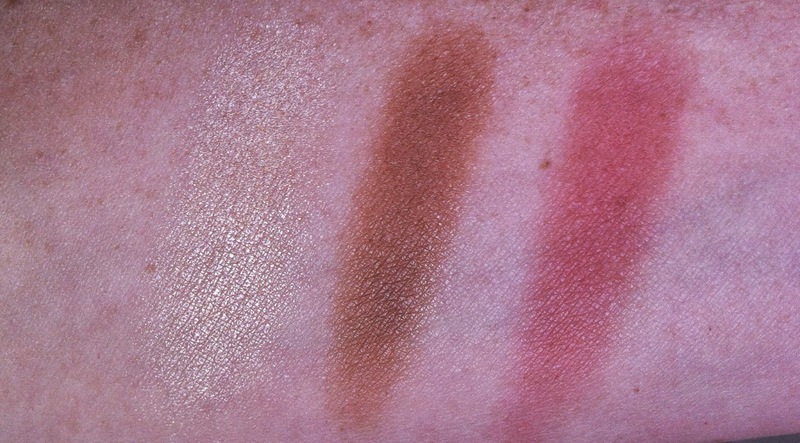 I think it is always helpful to include swatches ( which I do in most of my posts ), and I have also included a picture of a "look" I created inspired by these shades, and Arbonne's Winter Edit ... embrace the pale skin, add a pretty flush to the cheeks, keep the eyes simple, and the quintessential deep, rich winter lip. Eye Shadow - Cabernet - is a beautiful, rich, burgandy/brown. As soon as I saw this I thought it would be perfect in the outer corner, or outer V to create depth. To touch it is almost creamy, however once on the skin it became a little patchy and difficult to blend. Having said that, I thought it might work well as a liner instead, and it certainly does! I used an angled liner brush and pressed it into the top lash line. You'll see in the photo below I also extended the shadow beyond the lash line to make a wing. This shade makes a nice alternative to a traditional black, or standard brown liner, and it is a good way to make use of a lovely shade of eyeshadow that may not blend out as well as you would like. 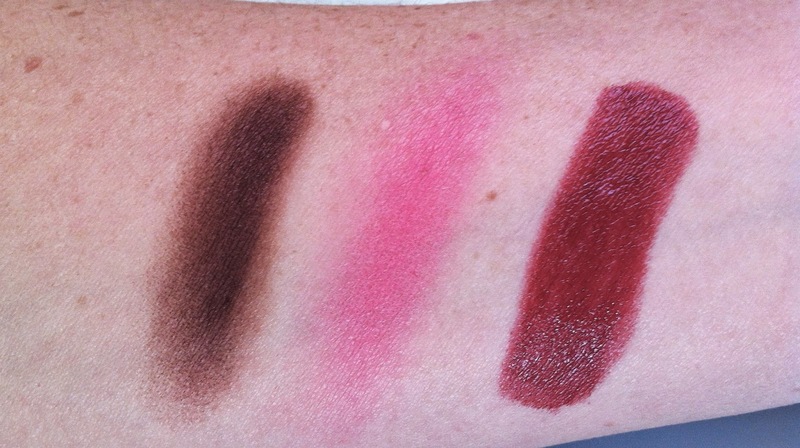 These shadows are available in a range of 20 shades, for $27.00 AU each. Blush - Taffeta - this blush has been in my everyday makeup drawer since it landed at The Beauty Vine HQ, and has become one of my most reached for shades this winter. 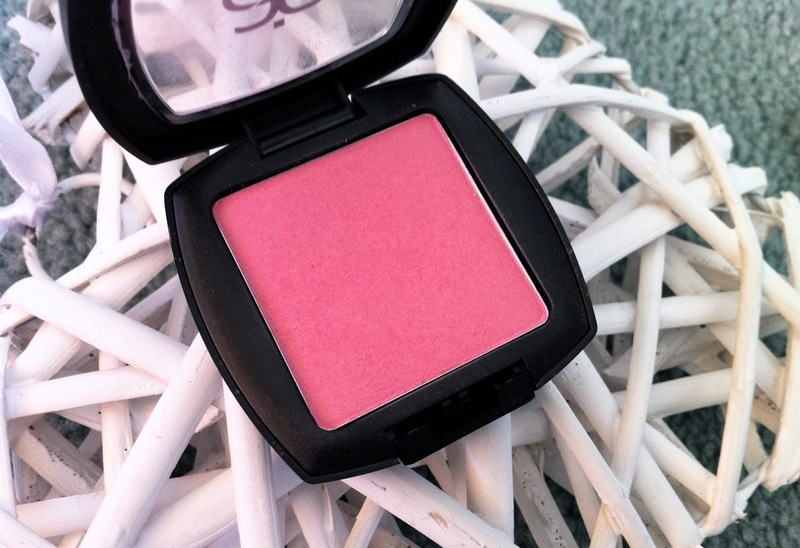 Although it is most certainly pink, it has lovely warm undertones, and blends beautifully on the skin. It is a matte formula, but I find it gives a beautiful luminous glow to my cheeks. The staying power is also very impressive. In my opinion, it is a little pricey for a blush, at $41.00 AU, but I am so impressed with the formula, I would absolutely consider purchasing more shades to try. Lipstick - Jam - oh such an appropriate name for this lippy! It fits perfectly! Whilst it certainly has depth, it is subtle and a little more grown up (not too vampy). If you are just starting out with deeper shades, this one would be the perfect introduction. The formula feels lovely, very nourishing and lightweight. I did find that I would get the best results if I used a little lip liner with this shade. I am starting to get some fine lines above my top lip ( yay for getting old ) and this lipstick did travel a little bit on me. Of course if you are in the first flush of youth, this would not concern you at all! I would also recommend to gently exfoliate your lips prior to application. It is a sheer, soft, emollient formula, and the pigment tended gather a little on any dry patches. It wore very nicely, and left a pretty, even berry stain on my lips for most of the day. These lipsticks retail for $37.00 AU and are available in 14 shades. You can find the Arbonne website here and from there be directed to your country's website. If you happen to be an Arbonne independent consultant, feel free to leave your link in my comments section. Have you tried any Arbonne products? Do you have any favourites or shade recommendations for me? Do you struggle to take a half decent selfie like me, and end up looking a little startled? Do feel free to say hello in the comments below, I am always happy to see a link to your blog if you have one! 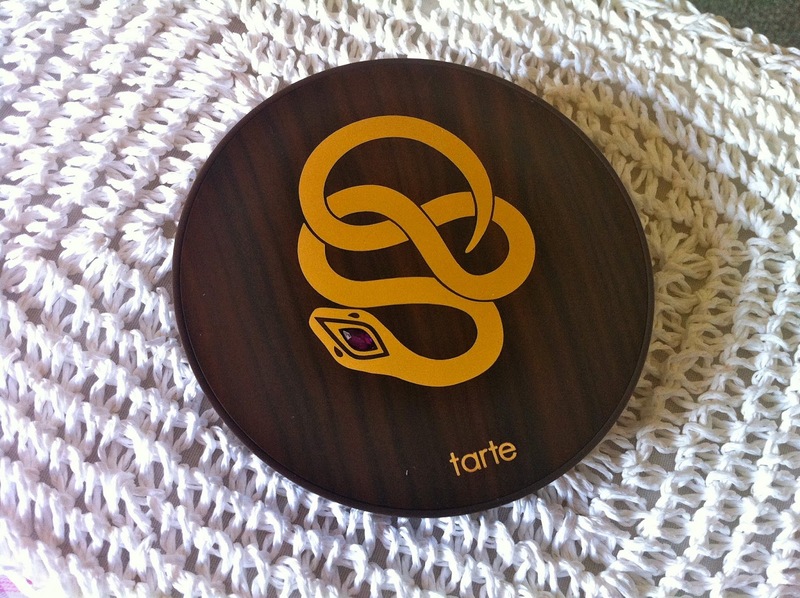 TARTE Rainforest After Dark Eye and Cheek Palette | Swatches and Chat! 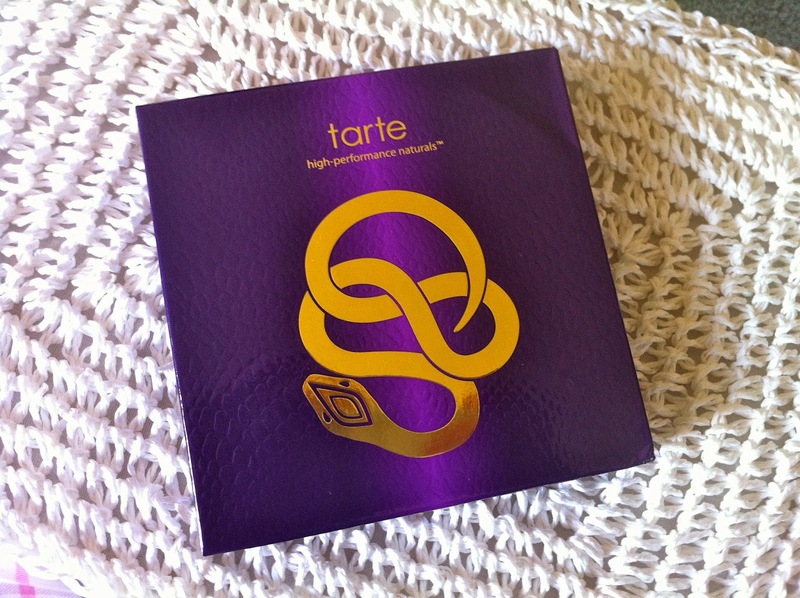 If you read my post on the Tarte Be Mattenificant palette, you may recall me saying that as soon as I saw photographs of it I knew in my heart that I would simply love it. Well... history has indeed repeated itself, and it would appear that I am now the proud owner of the Tarte Rainforest After Dark Cheek and Eye palette. And oh my... she is a beauty! The highlight, Champagne has a beautiful pale gold undertone... so pretty! I have always wanted to try Park Avenue Princess...it is beautiful! It is showing up a touch warmer in my photograph than in real life, and though it is matte it has a subtle luminosity...I think it will be gorgeous on the skin! Unleashed is a beautiful pink blush shade with slightly warm undertones...the sort of shade that you can wear with any makeup look. It feels like silk... can't wait to get this on ma cheeks!! So there you have it lovelies. I apologise for my overuse of the following adjectives; beautiful, silky, creamy and smooth. I purchased my palette on eBay, from a seller in the US. I believe she only had two of the palettes, and both have sold. I will check again, and let you know if she has any more listed. If you would like the seller's name, leave me a comment below and I will add it to the post as an edit. You girls in the US are so lucky to have Tarte!! It is really hard for us poor Aussie girls to get a hold of! So, are you tempted? Have you already purchased this palette? Do leave a comment below and let me know what you think of it!